The most common cause of black streak is the material residue in the injection moulding machine barrel. Residue remains in the plunger injection moulding machine. For valve gated injection moulding machine, the valve-regulated part also tends to remain residue. The air is compressed to a high temperature in the cylinder, with the high temperature gas in the gate, so it will be easy to be black streak. Immediately: When replacing the material, reduce injection pressure, lower the temperature of heating cylinder. Short-term: Clean the heating cylinder (with wire brush). Pigments, paints, lubricants, ultraviolet absorbers, antistatic agents in the mixed resin can be overheating in the barrel. Long residence time of the thermal decomposition of these materials is also the reason of black streak. Especially certain types of additives have bad heat resistance, in this way the tendency will become increasingly significant. When using PC material, valve-controlled nozzle is also prone to black streak. Screw with a backflow prevention washer is easy leaving burned residue. 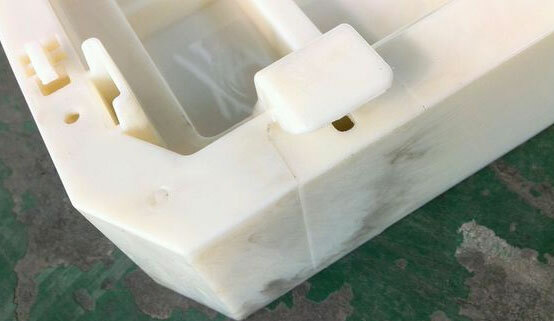 If you do not use special cleaning materials, it is necessary to use ordinary soft polystyrene materials as replacement.